If you partake in welding errands, let me ask if you have safety gears for that job or no. Since welding involves many risk encounters, you are required to take all necessary precautions. Herein, a welding helmet is one of the gears you should buy to guarantee your safety. Apart from safety, the helmet will make you comfortable with welding tasks. Being safe implies that you will concentrate on higher quality work. You might have made the right decision to buy a one, but how do you buy the best welding helmet? Yep, not all helmets will be comfortable for you. So with so many brands and models available, it can be challenging to choose the best one. Lucky enough, we will help you today with our in-depth article. In this piece, we are going to review the top products. So if you have been searching for the best welding helmet for the money, this article is for you. You will find out various and best budget helmets reviewed with pros and cons. Plus, you get to know how to choose the best product. 1 Why You Need A Welding Helmet? 5.1 Do higher prices mean good quality to guarantee my safety? 5.2 What is the perfect type of helmet for different welding types of materials? 5.3 What is the lens switching speed? 5.4 What is adjustable delay control and how is it important when choosing welding helmets? 5.5 Are there any other gears that I should buy with a welding helmet? 5.6 What is a flash burn? Why You Need A Welding Helmet? There are various reasons why you are required to buy a welding helmet regardless of whether it is the best in its class or not. It is a safety headgear that you can wear during the welding job. It will mainly protect these three parts of your head; the eyes, face, and partially the neck. It protects these three parts from harmful ultra-violet rays. Also, safeguards your head from sparks, burns and infrared light. With the right helmet, your eyes will be saved from injuries, flashes, and UV light. So, there will be no eye damage or retina burns that can lead to the loss of the sight. Being protected, it implies that you will be feeling comfortable and secure thus concentrating on your task for a higher quality result. There are many types of welding helmets that you can get on the market. Here are some of them. This type of helmets is usually designed from plastics. It usually has a solid structure built for longevity, and they can withstand rough applications in the welding process. They are also far more affordable when compared to auto-darkening ones. They come equipped with ultra-violet or infrared coatings and thus, it assures your safety from harmful external rays from the sun. With this type of helmet, you can view through various angles. Its usual extended form protects your face against fumes, slags, and other physical risk agents. This type of helmet also comes with an allowance of sensitivity adjustment and so the wearer can easily set as per preferences. It can also be regarded as a long-lasting type of helmet. However, it has some downsides when compared to other types. A repeated up and down flipping of this helmet can result in neck fatigue or some injuries to the wearer. They are intended for experienced welders and not for beginners because there is caution not to put them off while the arc can flash while welding. Let us see the next type. Here is another type of helmet that is very light and usually designed to lessen the neck discomfort. In most cases, it has light sensors closely present to the lens that aid in viewing the sunglass shade. This light sensor improves the coverage. It also comes with adjustable delay control that you can use to set on how long the lens can stay even after the welding arc has stopped. This type of helmet proves the best when it comes to providing a clear vision. Furthermore, it also has sub-types. Let us expound on the sub-types of the auto-darkening type of helmets. As from the name, this auto-darkening type of helmet comes with a lithium battery that can be recharged using a solar panel. The advantage of this type of helmet is that when the power is down, a solar is used as a back-up where there is sunlight. When you decide to choose this sub-type of the auto-darkening helmet, consider the one with alkaline batteries as opposed to lithium. They are powered with a solar, but they have no battery. Their main advantage is that there will be no need to buy replacement batteries. They have low running cost and thus a significant investment as they can save a lot of money in the long term. The next type under auto-darkening welding helmets is the battery powered with no opportunity for solar. The advantage of this type of helmets is that the purchaser can start using them immediately, given that their battery has some charges. You should have a set of spare batteries. This is because you don’t want to stop in the middle of your welding process only because of battery power. Fixed lens shade auto-darkening helmets are mainly suitable when welding standard type of material. Although it can also be applied to many different welding processes. They usually come with a typical shade 10 lenses. However, you can also get one with a shade 12 lens, although a rare case. 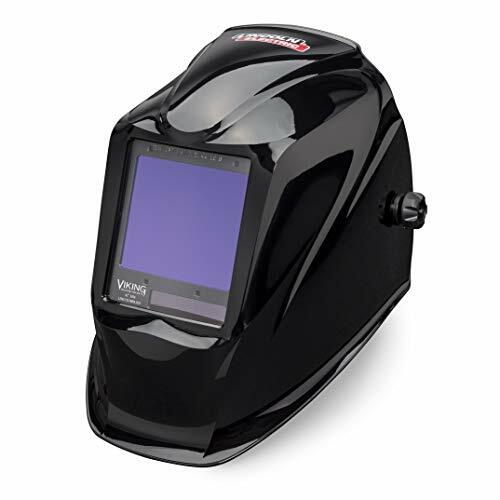 A variable shade lens is another sub-type of the auto-darkening welding helmet. This type can be regarded as more convenient when contrasted to fixed lens shade. Why? Because they allow the wearer to adjust as per type of material and this makes them usable for any material as opposed to fixed lens shades. To open our list, we start with the welding helmet from DEKOPRO that is solar powered. This helmet has some features that made its way to in this rundown. 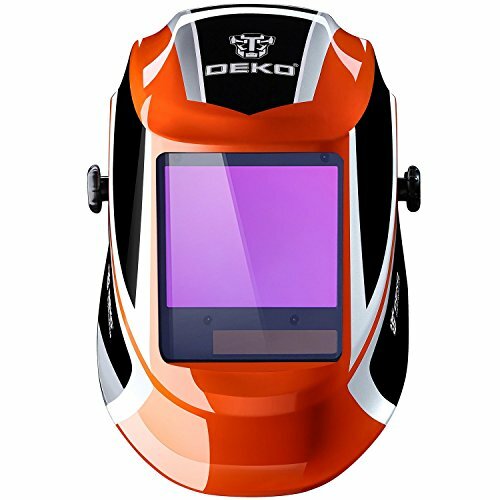 One feature that DEKOPRO welding helmet has is the auto-darkening capability. It has auto-switching of 1/25000 from light to dark. Furthermore, it is a shade 6 kind of helmet. This implies that the user will be protected from AR and UV radiation even if the electrometric fails. It has a rating of 1/2/1/2, which confirms with the ANS121287/1-2010 and EN3794/913 standard requirements. This is a confirmation that you will be sure when it comes to protection and safety. DEKOPRO additionally comes with 3.62 by 1.65 inches of standard and clear view area. These will guarantee a comfortable and clear view to the user. On the other hand, the capability to vary the luminous transmittance, regular dependence, and diffusion of light will make it possible for the welder to see different angles. 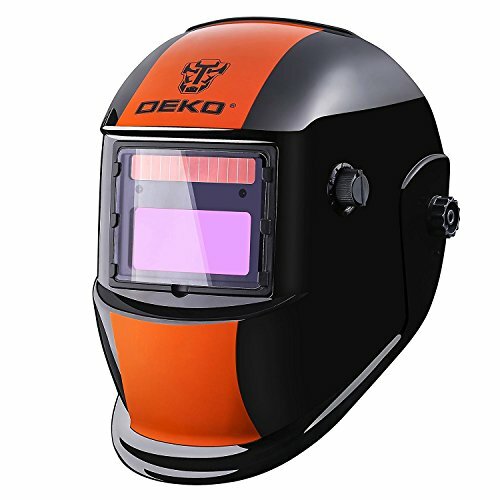 Moreover, the DEKOPRO welding helmet is lightweight. This will allow the user to work for many hours without feeling fatigue or uncomfortable. It also has the ADF Dx-500s auto-darkening lens filter that is adjustable. This can allow the welder to work in different environments by just controlling the lens schedule. One last feature that makes this helmet stand out among others is the fitted delay and sensitivity settings. This will facilitate the user to adapt to various task duration and environment. Furthermore, it also has a highly enhanced color and visibility recognition. At number two, comes this welding helmet from JACKSON SAFETY. Indeed, from its name, you can classify it. It comes loaded with the variety of safety features to protect the user entirely. If you have been considering safety as the primary factor when choosing the welding helmet, then the Jackson Safety 46131 is for you. As it is always security should be the main factor to consider. The Jackson Safety 46131 helmet comes with smart fitters that can allow the user to operate in a different environment or with irregular timings. The incorporation of delay and sensitivity adjustment makes this product an ideal safety headgear. Additionally, the four premium sensors with easy to adjust controls render this helmet highly effective. Furthermore, the Safety 46131 helmet comes equipped with super performing lenses and high–grade components. What is more impressive is that, with all these features, the helmet costs lower than its counterparts. It also has auto-darkening features. So, you will get a perfect optical clarity even if the work is done. This also makes the helmet workable for both hobbyists and professionals. 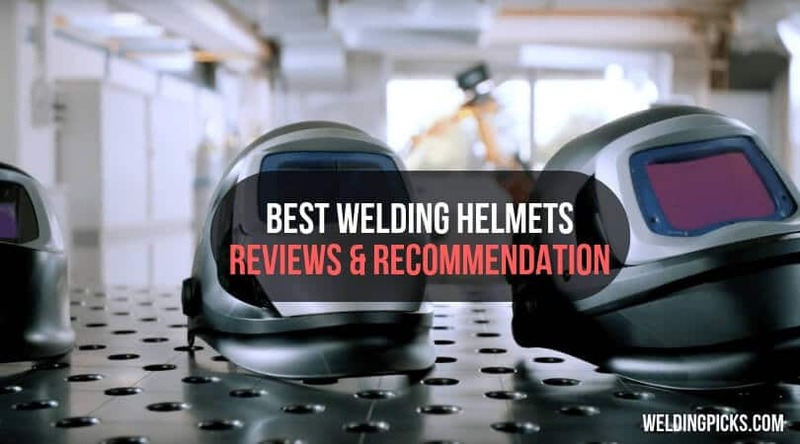 Indeed, if you have been on the lookout for the best and affordable headgear for your welding errands, then Jackson Safety 46131 ought to be your choice. To keep our list flowing, here comes a welding helmet made from fiberglass material. It is a shade 10 helmet that measures two by 4 inches. It also comes equipped with some fantastic features that booked it a place on our list. The first remarkable feature is its super glass plus material. More so, it has a rugged construction that makes it meet some of the welding demands. The Fibre-Metal 110PWE is also a self-distinguishing helmet. So it is fireproof. Besides, its surface is designed to smooth to deflect any spark or spatter during the welding process. Undeniably, what can conclude is that the design of this product is superb. One thing that we will also not forget about this helmet is how it reacts to any impact. For sure, this helmet is impervious to any fluid or moisture. This implies that the user can apply it in conditions with either fluid or moisture without any worries. On the other hand, it has a paper liner that is resistant to any impact. So you cannot split or crack it even when exposed to a massive impact such as falling. This implies that you will be protected and have a long-lasting application of this helmet. Another thing you can appreciate from this helmet is its minimal design. Unlike other welding helmets that require huge storage space, this one saves on that. So, if you have limited space in your workshop, the Fibre-Metal 110PWE helmet is an excellent buy. Its compact design will be very advantageous in such a situation. Furthermore, when it comes to comfort, this helmet has something to show off. We can guarantee it will give you the maximum comfort you are looking for. This helmet is very lightweight, and it can be used for long hours. You will not feel dis-comfortable or fatigued. It will also not feel tiring to wear. For this remarkable product, its durability, functionality, and look make it worth the purchase. Honestly, when quality is equated to its price, we can conclude that this helmet will not leave a hole in your pocket for nothing. Its value is high than the price it calls for. 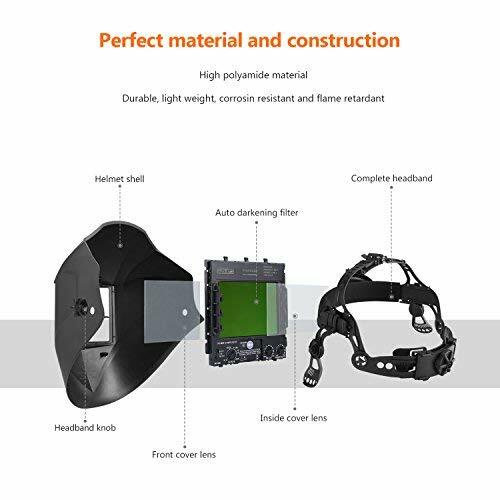 So if you have been on the lookout for a best budget auto-darkening welding helmet, then Fibre-Metal 110PWE is an ideal option. Are you looking for the best helmet that can offer optical clarity and meet safety standards? Well, the Tacklife PAH04D should be your favorite on this rundown of the welding helmet reviews. Honestly, the Tacklife PAH04D is incomparably a top-notch welding helmet that was designed with safety standards in mind. 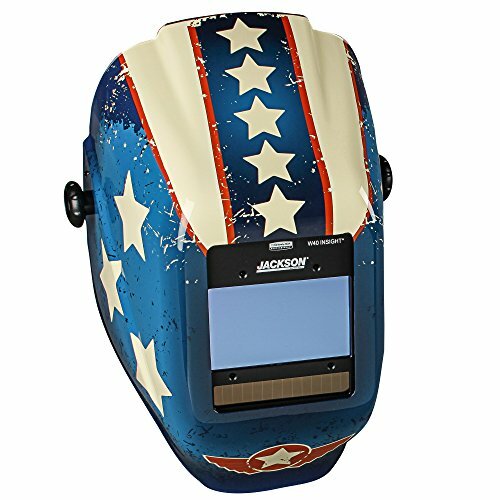 Again, if you have been looking for the best helmet for the TIG, MIG or MMA welding, then the Tacklife PAH04D should also be something to factor down. Moreover, if optical clarity is what you are looking for in addition to versatile use, this helmet still has a position. Additionally, it comes equipped with sensors for the excellent viewing experience. It also arrives crafted to give great ventilation and clear viewing for better result during the welding process. Being made from Impact proof PA material, this helmet is lightweight and will not poses any risk of fatigue or feels tiring during the welding process. Its design was to support the users head to reduce fatigue and the feel of tiring around the neck. Apart from safety, optical clarity and weight, what makes this helmet worth a purchase is its capacity to reduce eye-strain. It also protects against UV/IR rays. This is not the usual feature that you can easily get in any welding helmet. At number five, find a helmet that is suitable for those partaking in different types of welding. The DEKOPRO solar powered helmet comes in an attractive and beautiful design that not only looks perfect but meant to protect. The DEKOPRO solar powered helmet features optimal eye protection. It is designed to automatically switch from light to dark if there is any welding arc. It is a shade 16 kind of helmet that protects the welder even on power blackout. Furthermore, this helmet has a manual adjustment. It also has high sensitivity and delay settings. This makes it ideal in different working environments. With its 7 square inches of clean view, your welding experience will be positive. The welder will also be able to see in different angles as it has an angular view capability. It also has an inbuilt intelligent and practical auto-darkening feature. This implies that it can quickly protect the user from instant light or rays. Furthermore, it comes fitted with the solar panel that can be used to charge its long-lasting batteries that have a lifespan of up to 5,000 hours. So, in summary, this solar powered helmet is lightweight that is easy to wear, or unwear. It is also free of fatigue or discomfort and made to protect against UV/IR rays. Thus, it is the perfect purchase for those partaking in maintenance, repair, and other operations that involve welding process. When you have a safety welding helmet, it means you are more concentrated on your work. This will result in greater quality or outcome. So, if you need to see yourself producing quality outcomes, then buy the Jackson Safety Insight with the auto-darkening feature. This helmet protects and performs like what a top-notch helmet can do. The helmet is highly versatile as it provides an option to choose from welding to grinding modes. 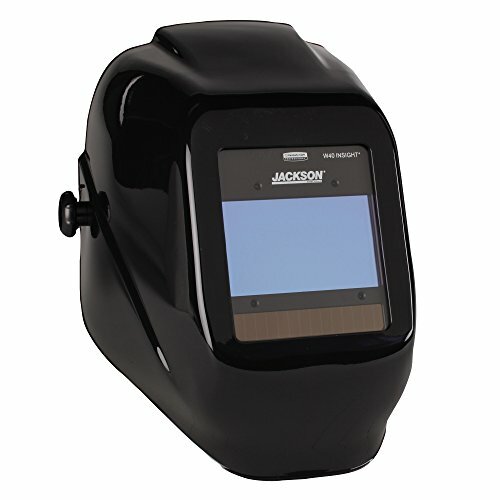 Furthermore, the Jackson Safety Insight with the auto-darkening feature is designed with variable shades thus making it suitable for different type of welding materials. It provides a wider viewing area that can allow the wearer to see a wide range with higher optical clarity during the welding errands. Moreover, this protective unit has easy to use digital settings and independent sensors. So the welder will be able to work effectively. Safety Insight Variable Auto-Darkening helmet is designed with safety standard in mind. So if you are worried about UV and IR rays, this helmet should be an option. With this helmet, your eyes are protected and safe. And if you have any skepticism, read its name again. Also, one thing that you will appreciate about this helmet is its comfortability. You will be able to do your welding tasks without feeling tired or fatigued around the neck. You can adjust the straps that can be adjusted to give a perfect and comfortable fit thus you will weld smoothly. Tacklife pro welding helmet keeps our rundown life by finding its position at number seven. To start, this helmet comes with an optical class of 1/1/1/1. This will offer both you and your eyes the required protection. It also equips an extensive range of shades. With a range of 9-13/ 3/4 -8, this makes it suitable for a wide range of applications. On the other hand, it also comes with a super and large viewing area spanning 3.9 by 2.87 inches. This will guarantee a better welding precision. This Tacklife pro welding helmet has a delay, sensitivity and step-less adjustment knob for an added protection. It has a highly designed magnifying lens for compatibility. Another thing that you will also appreciate about this helmet is the easy adjustable and responsive headband designed in up and down turning way. The design is vital in reducing fatigue around the neck thus guaranteeing comfort. Also, you will appreciate its fast auto-darkening speed of about 0.00004 seconds. Its body is made of PA material known to be fire-proof and corrosion resistant. The materials are also light and make the helmet lightweight to last long compared to its counterparts. The Tacklife pro welding helmet accompanies black carrying case and 6 pcs lenses. The bag is an added advantage for easy storage. It also accompanies a sustainable CR2450 lithium battery that is eco-friendly. Another best budget welding helmet that we can’t forget to include in this rundown is the Fibre-Metal 110WH. This type of helmet has a tough and rugged super glass that is additionally lightweight. The super glass material makes this helmet impervious and resistant to moisture. It is also an impact-proof option. You will appreciate its smooth surface design that will deflect any spark. Furthermore, with its impact proof design; you will be able to access tight clearances and places with limited space where an ordinary helmet cannot enter. 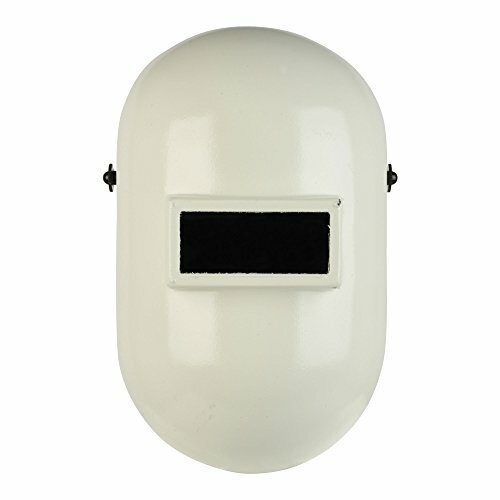 Fibre-Metal 110WH helmet is 2 by 4 shade 10 lenses. This will guarantee a clear viewing during the welding process. Moreover, this helmet is believed to have the capability to filter any AR or UV rays to 100%. So you will not have to bother about the safety of your eyes. With a constant fit rubber headband that is fitted on this helmet, you will have a custom fit. The rubber headband is adjustable, and it can help set the helmet when finding the best angle and position for a comfortable and clear view. It also has free-floating arms that will ensure a comfortable experience by lessening pressure points. The free-floating arms will as well facilitate the right stability and balance during wearing. 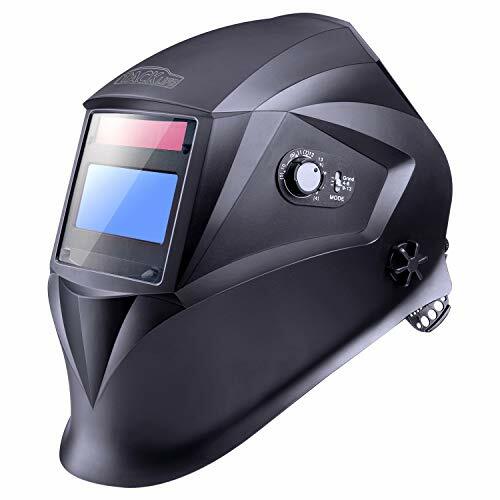 The Antra AH6-260-0000 finds a second last place on our welding helmet reviews because of its fantastic features, customer feedback, and the value for the price. Well to start, its look is what can make you spend your saving. It is a small helmet. However, very stylish too. Honestly, it is more like a small tool than what it is as a welding helmet. It is designed to the full protection against UV and IR. It will protect against flash burns. With this features, I don’t see the reason why you should not consider this helmet. Furthermore, this welding helmet can do well with MMA, TIG or MIG and plasma application. It also comes equipped with a grinding feature at a lower price. So if you have been on the lookout for an under the budget helmet, the Antra AH6-260-0000 should be your immediate option. In addition to that, it also arrives with compatibility magnifying lens that will help easily work over the details. I know you have been looking for a helmet that is impact proof, and this one can’t miss on you as well. It has inbuilt impact resistance feature that can protect against heavy impacts. For a better experience, the helmet has sensitivity settings in addition to tension adjustment feature that you can use to adjust the lens. Furthermore, the helmet accompanies spare lens cover that can be applied to protect the exterior of the helmet. It also accompanies a durable battery that can be charged with a solar panel on the helmet. The performance of the battery is good, and you will work for long hours without the forced stop due to power. So, if you have been on the lookout for the best helmet for your personal use, the one that is cheaper, durable and with a sensor, then the Antra AH6-260-0000 should be your final consideration. It also has a reasonable price sticker. From the all of the above products, you haven’t yet made your mind, right? I know welding is a tasking job and you need to be keen when buying a protective gear such as a helmet. You don’t have to buy the one that will be uncomfortable and not well fitting. However, the Lincon 3350 being last on our last doesn’t imply it is last in everything. It is a helmet you must consider when looking for a well-fitting and comfortable experience. 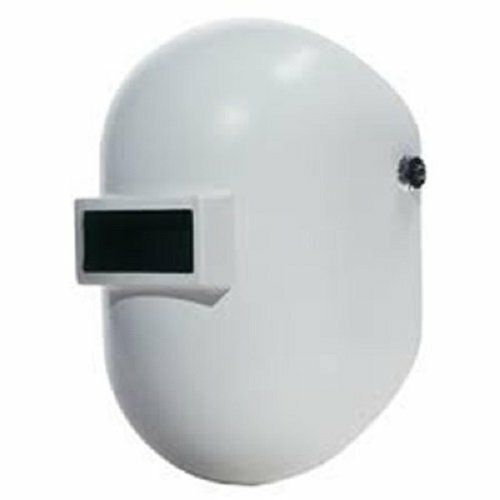 It is also an option when looking for a cost-effective welding helmet. This is the reason why we can’t close our review without mentioning it. 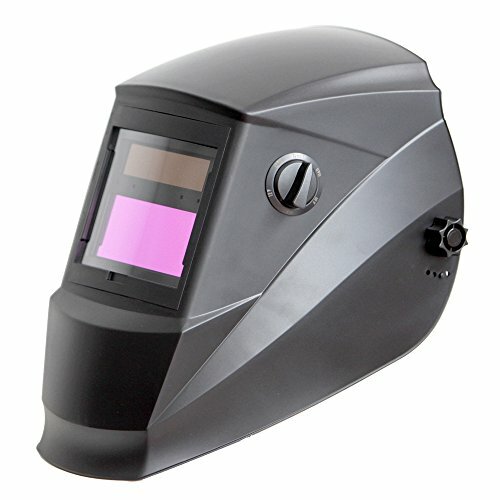 The Lincon 3350 is one of the safest helmets for welding that you can get on the market. It comes with unique features and that are professionally designed. You will have maximum safety and protection of the eyes against harmful rays such as UV and IR. It offers a high-quality optical clarity from its superb 4c lens technology. You will agree on this rare feature in most of the helmets. This is a very advantageous feature. It clears off the green tint that comes about after dark lenses. Moreover, it has a larger viewing area that will allow free head movement. Its auto-darkening feature and a big front panel is heat proof as other things I will not forget to mention about this helmet. Honestly, this helmet is more than professional as apart from protecting the eyes, it protects the head against injury via the firm shell. The helmet will also protect against physical harms that can happen in the workshop. Just like any other commodity you can get in the market, the welding helmet varies in quality, material, and price. This makes it challenging when you need to choose the best and the most comfortable for you. This is where this section becomes very important in this article. Below, we talk about some key elements to reflect while selecting your welding helmet. Based on the type of lens, you choose either auto or passive. The auto a lens is usually dark and comes coated with infrared and ultra-violet protective materials. You can get them in different varieties and rating. In most cases, are rated as three or four. On the flip hand, the passive lenses that are commonly available come in 10 dissimilar shades. Herein, the auto lenses are preferred over passive ones because they give various quality work. Heavy helmets are very tiresome to work with. They also accompany the high risk of fatigue. So when choosing your helmet, always go for the lighter one. This would be a step to comfortability and long working hours without feeling fatigue. When considering the type of rays, you will have to decide between varying or fixed rays. They are very vital determinants of the usage of your helmet. If you are going to handle different materials, go for one with varying rays. With fixed rays, you will be required to purchase another helmet when you want to work on different material. This is not the case with varying rays, as they adjustable to suit different materials. The lens switching speed determines how fast your helmet lens will auto adjust as per the rays it is receiving. There are many different helmets with different lens switching speed. During your selection, it will be good to choose one with the fasted lens switching speed. However, it can cost you higher. Different helmets have a varying quantity of sensors. Therefore, you better plan to grab a helmet with the most sensors possible. The quantity of sensors determines the coverage of your helmet. You will get different helmets with a different number of sensors. For the safe side, always opt for one with the highest number of sensors. Do you know some of the national safety standards a welding helmet should have? There are certain safety requirements when it comes to lens darkening, lens switching mode, and material. Each nation has its set standards. So when choosing your helmet always guarantees that you go for one that confines with set standards of your state. Below, find some of the questions that have been repeatedly asked by those looking for the top rated welding helmet. If you might have been having such questions, you will get a precise response today. Ok, let us see. Do higher prices mean good quality to guarantee my safety? There is no direct association between price and quality. A high price doesn’t imply that you are going to get the best quality. So go for a maximum quality product at least price. What is the perfect type of helmet for different welding types of materials? For different types of materials, it is better to choose a helmet with variable shade. You will then be changing the shades to suit different materials. What is the lens switching speed? This is an indicator of how fast the lens will be back to its natural state of light absorption. What is adjustable delay control and how is it important when choosing welding helmets? Is a setting that allows the user to adjust how fast or slow the lens will be darkened after welding arcs have stopped. Are there any other gears that I should buy with a welding helmet? What is a flash burn? This is an injury that results when a person is exposed to direct UV without eye protection gears. For example, during welding one can suffer a flash burn from the UV rays that come from a welding torch. It is now clear that helmets come in different varieties made by different companies. They also differ in quality, efficiency, and performance. According to this review, you can as well notice that they have different weaknesses and strengths. Therefore, safety is an important point to consider during your selection. What we remind you, always choose the helmet that protects you from any exposure to extensive arc rays? Other elements will then follow, but safety should be the critical consideration. For the above best welding helmet, your health will not be at stake as our editor wisely selected them factoring safety.